Most regular readers will have already noted RealClimate’s coverage of this year’s record Arctic sea ice retreat. Let me also point out that it has made the New York Times, with the headline “Analysts See ‘Simply Incredible’ Shrinking of Floating Ice in the Arctic“. Also, Fergus has some interesting discussion and fascinating links. The main conclusion of this analysis is that sea level uncertainty is not smaller now than it was at the time of the TAR, and that quoting the 18-59 cm range of sea level rise, as many media articles have done, is not telling the full story. 59 cm is unfortunately not the “worst case”. It does not include the full ice sheet uncertainty, which could add 20 cm or even more. It does not cover the full “likely” temperature range given in the AR4 (up to 6.4 ºC) – correcting for that could again roughly add 20 15 cm. It does not account for the fact that past sea level rise is underestimated by the models for reasons that are unclear. Considering these issues, a sea level rise exceeding one metre can in my view by no means ruled out. In a completely different analysis, based only on a simple correlation of observed sea level rise and temperature, I came to a similar conclusion. As stated in that paper, my point here is not that I predict that sea level rise will be higher than IPCC suggests, or that the IPCC estimates for sea level are wrong in any way. My point is that in terms of a risk assessment, the uncertainty range that one needs to consider is in my view substantially larger than 18-59 cm. On the other hand, we have a recent quote from no less than James Hansen, stating that he finds the concept of sea level rise this century not “measured in meters” “almost inconceivable“. Hansen also claims that climate scientists systematically understate risks, for pretty much the same reason that the denialists claim that we systematically overstate risks, i.e., social, political and financial pressures. So, practically, say if we are a petrochemical concern with billions of dollars invested near sea level, how should we consider these risks? First of all, there is a precedent for sea level rise much faster than a meter per century in periods of global warming. In fact there are two of them clearly represented in coral records. These can only be associated with rapid decay of either the northern or the southern ice sheets; too much water is involved to attribute the rise to any other source. Here is some evidence regarding the earlier pulse. It may help you to understand the graph to know that geologists tend to run the time axis backwards. Time is thousands of years ago on the horizontal axis, the vertical axis shows depth below contemporary sea level in meters. 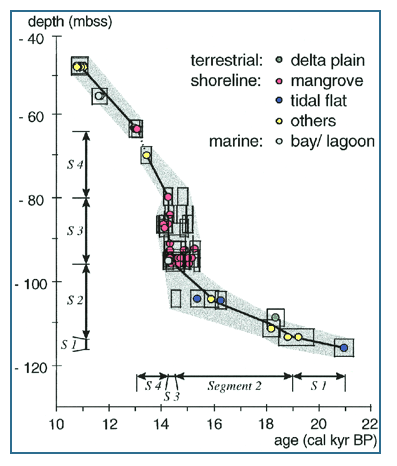 Each data point is obtained from some mud with evidence of when it supported mangroves; i.e. ; was near sea level. Note that the fastest sea level rise is not resolved. The increase in sea level from the last glacial maximum has been derived from a siliciclastic system on the tectonically stable Sunda Shelf in Southeast Asia. The time from 21 to 14 thousand calendar years before the present has been poorly covered in other records. The record generally confirms sea-level reconstructions from coral reefs. The rise of sea level during meltwater pulse 1A was as much as 16 meters within 300 years (14.6 to 14.3 thousand years ago). A clever technique has identified the source of the pulse as Antarctic, which causes some headscratching because the forcing of the major glacial retreats is usually described as being in the northern hemisphere. (Sea-Level Fingerprinting as a Direct Test for the Source of Global Meltwater Pulse IA; P. U. Clark,1 J. X. Mitrovica,2* G. A. Milne,3 M. E. Tamisiea, Science V 295 pp 2438 ff, March 2002) Nevertheless, a big chunk of the Antarctic failed first; if I understand correctly its remnant now forms the Ross Ice Shelf. Meltwater pulse 1a increased sea levels by about 16 meters over 300 years or less; the record is not fine enough to tell. So we have a precedent of at least 5 meters of sea level rise per century; for practical purposes it must have been faster than that at some point. Let me emphasize the take home point. We do not have any strong limit on how fast significant chunks of Antarctica can fail, neither theoretically nor observationally, but we know it can be at least as fast as 5 meters per century. There is little doubt that contemporary human behavior is destabilizing both Greenland and the West Antarctic, implying an eventual sea level rise of an additional 15 meters (dominating thermal expansion and minor ice caps). What we don’t know is how fast this will happen. There is a moral question as to whether we should care how fast. Perhaps we have a moral obligation to future generations not to burden them with the consequences of our own profligacy. We are pretty sure that under sustained double-CO2 equivalent conditions both the West Antarctic and Greenland would collapse eventually. The question is only “how soon”? We simply don’t know in detail how or when the ice caps will fail. Ice dynamics turns out to be an amazingly complex process and observations are expensive and relatively few. Hansen is not a glaciologist, so his intuitions probably should carry less weight than the core professionals. However, I know some of them, and they just aren’t taking strong positions at this point. The physics of the question is a race between the structural integrity and thermodynamic inertia of the ice on the one hand and the warming on the other. I personally find it entirely conceivable that one or the other will win out in the short run (i.e. on policy time scales); from what I can tell this is in line with much expert opinion. Some people are still resisting the idea, while others, or at least Hansen, go out on a limb in the other direction. In the long run, presuming no dramatic change in human culture, the warming will win. The structural integrity of some major ice sheet component will fail, and sea level will go up by tens of centimeters per decade for a while. There is good reason to expect two (one per hemisphere) or more very rapid increases. Not tsunami-like, but over a few decades. Recent results have come closer to understanding the physics of ice sheet retreats. They are reasonably expected to be episodic. There will almost surely be meters of sea level rise in a century if we don’t change our ways very soon. What isn’t clear is which century. Place your bets, ladies and gentlemen; which cylinder has the bullet? Note: This article is a follow-up to another recent posting of mine about low-lying Gulf Coast infrastructure which has generated a lot of interest. Updated: Newly included sea level graphic; some changes to the text moving the substance closer to the included graphic.